I saw the shrike Fri 1-29-10 about 4PM. It was perched over the culvert full of empty bottles near the recycling bldg.Another birder and I had only back views at that time.I parked along the road protected by the dividers and watched it chased some starlings twds the houses near the exit and perched in the top of the screen of cedars behind those houses. It then flew into the trees in the empty lot and back twds the landfill. 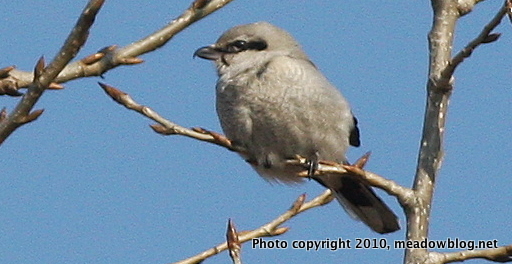 I have a couple photos so I’m sure it was the shrike. It then went into the plants in the vacant lot and returning twds the rubbish. I have a several images so I’m sure it was the shrike.